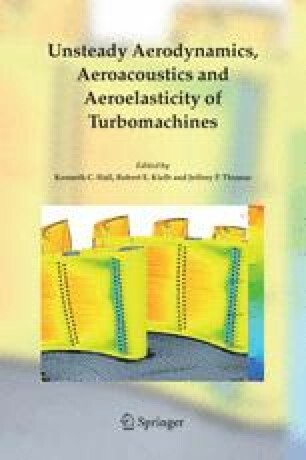 In this paper, we present the a three-dimensional time-linearized unsteady Euler solver for computing unsteady flows in multistage turbomachines. Using this approach, each blade row is modeled with a computational grid spanning a single blade passage. Within each blade passage, several time-linearized unsteady solutions are computed, one for each of several “spinning modes” retained in the model. Each spinning mode has its own frequency and interblade phase angle. These various solutions are coupled together at the inter-row boundaries between the blade rows. Results are presented for several geometries, and demonstrate the accuracy and efficiency of the method, as well as the importance of multistage effects. In particular, we show that multistage effects can strongly affect the aerodynamic loads acting on a given blade row. Furthermore, the method presented is highly efficient. For example, to perform a flutter calculation requires only about three times the CPU time of one steady flow computation for each interblade phase angle and frequency considered.